My kids do not get cute little creative lunches or sandwiches cut into shapes. in the early morning is really not my thing. Thankfully, I am developing a go-to roster of "acceptable" menu items. 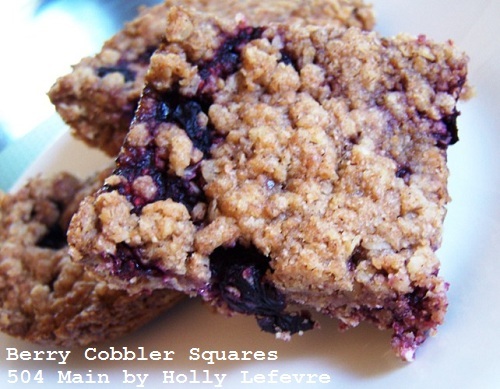 One of their favorite snacks are these Berry Cobbler Squares. Of course they were a hit. declared these were better than the original. WHAT!? I have been trying to reduce the amount of butter in this recipe. I played around by incorporating applesauce and butter. 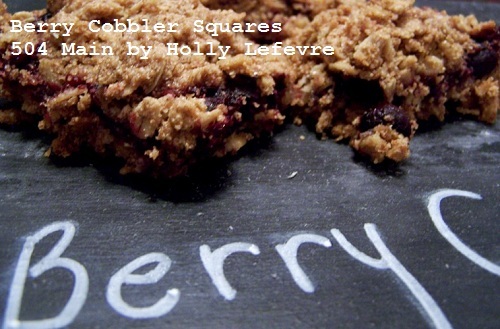 The taste was GREAT...but they were a teeny tiny bit crumbly. At the bottom of the recipe, you can see my notes, just in case you want to try it. Place 3 cups of frozen berries (or fresh) in a sauce pan on low heat and cook for approximately 15 minutes, stirring occasionally - just until they are soft but still hold their shape. Of course you can cook them down further if you prefer. My family prefers the whole fruit texture. In a separate bowl whisk together whole wheat flour, baking powder, cinnamon, ginger, nutmeg. Add the oats to the mixture. Layer about one half of the oatmeal mixture into the bottom of the pan, spreading it out into an even layer. If your berries have a lot of liquid, strain out the liquid or use a slotted spoon to reduce the amount of liquid. Spoon the berries evenly over the bottom layer of oatmeal. 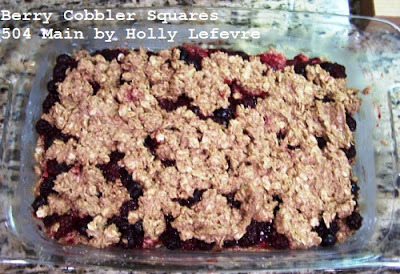 Use the remaining half of the oatmeal mixture and spread it as evenly as possible on top - mine is always a little more cobbler looking and uneven. 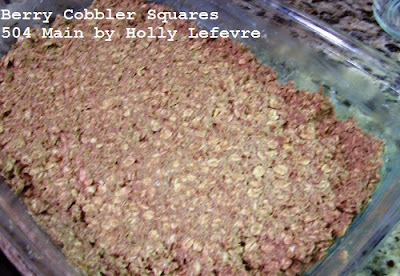 Bake for 35-40 minutes and then let cool completely before cutting into squares. As mentioned I have been trying to reduce the amount of butter. This was still a little crumbly, but not too bad...so here is how I reduced the butter "a little bit." Follow the other directions as above with these changes. 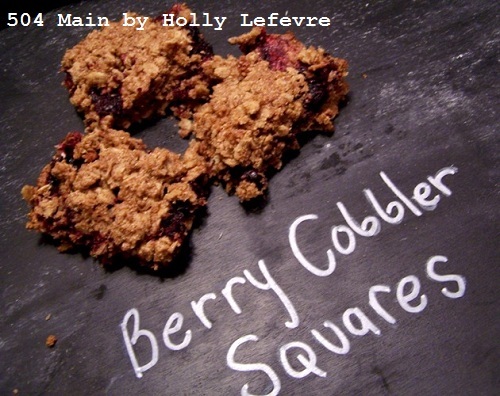 These look fabulous Holly! FYI....mind don't get cute little lunches either! ;) these would be great to try and have around! Those sound really great ... my kids would love to find those in their lunchboxes. Despite having already had lunch, your post is making me think of a second lunch. Those look super Holly. These bars look so good! I am going to try them real soon. I am an avid collector of recipes and cook books and I love to bake. Can't wait to try these out on my husband who loves strawberries. Thanks so much for sharing this! These sound so yummy. I love how you did the chalkboard underneath! Wow.. So nice work. Yummy yummy.. I would like to taste all these. Holly Lefevre, also try some other tips about buying beautiful furniture from Online Furniture Store or a Furniture Store . 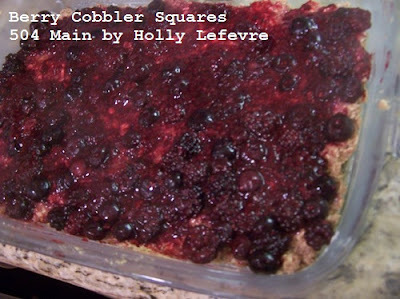 I adore berry cobbler! Thanks for the recipe! !